Takeaway: Through this sacred salutation, we can acknowledge and pay respect to the divine souls around us, humbly remembering our place in the universe. There is a precious moment at the beginning or end of a yoga class. You are comfortably seated, eyes softly closed and feeling somehow in tune with the beating hearts around you. The teacher guides the room to bring their palms together at heart centre and take a deep inhale. Exhaling, you bow the head towards your hands and a soft whisper of “namaste” sweeps the room. Whether or not you are familiar with the etymology of this sacred greeting, there is a resonance that somehow seeps beyond conscious comprehension. Much more than an empty hello or hurried goodbye, namaste and namaskar are ancient salutations holding a deep significance. Joining the palms together in prayer is cross-culturally symbolic. Signifying veneration, respect, sincerity and submission to a higher power, prayer hands are an international emblem of peace. In Sanskrit, this positioning of the hands is known as Namaskar or Anjali Mudra; palms touching and nestled in toward the chest, fingers pointed to the sky, head slightly bowed toward the hands. Both namaste and namaskar share the Sanskrit root namah, meaning 'salute' or 'bow.' Most yoga practitioners will already be familiar with Surya Namaskar, the graceful sequence of asana commonly known as a Sun Salutation; bowing the body, mind and spirit in reverence to the Divine source of all life. Namaste and namaskar offer a similar sentiment, a means of recognising and respecting the divinity in another being. In literal terms, the suffixes of namaste and namaskar offer different interpretations; te means 'you,' while kara is defined as 'action' or 'doing.' Namaste is, thus, more personal; a way of saying “I bow to you." Whereas namaskar indicates a more general act of paying salutations. Traditionally, namaskar inflects a deeper spiritual meaning, acknowledging and greeting the universal soul, the source of all being. Namaste is typically used to recognise the individual form that houses this soul. "the light in my heart recognises the light in yours," "the god in me bows to the god in you," "we are connected," "we are one." When namaskar is exchanged between two people, a spiritual connection is nurtured, developing gratitude toward fellow human beings and a sense of surrender to the universe. The togetherness and unity invoked by this simple greeting is arguably yoga in its simplest form, whether on or off the mat. The very nature of human intellect draws us to make instant judgements about the people we meet; good or bad, beautiful or ugly, friend or foe. These judgements are born from our pool of past experience and don’t necessarily always reflect truth. We tend to be in such a rush to spark conversation that we are unable to truly experience the person in front of us, unable to drink in the purity of their being, exactly as they are in that particular moment. Instead, our minds make up hurried assumptions, plastering labels that are tricky to scrub off later, unchanged by the passage of time or circumstance. Connection is usually associated with contact; handshakes, hugs or high-fives. Whilst there is obviously nothing wrong with the multitude of joyful greetings available to us, contact increases the risk of transferring negative energy and fortifies a busy mind. Namaskar Mudra is believed to transmit only positive energy, cultivating a connection that goes beyond skin-deep. Take a moment to think about it – can you imagine an angry person offering you a soft bow of the head, palms peacefully joined together? 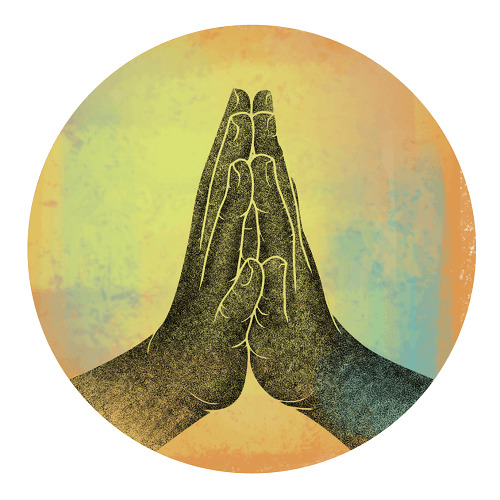 Much of the power of this greeting stems from the physical ritual of the mudra itself; bringing the palms together and bowing the head encourages humility, helping even the busiest of minds to discover and transmit calm in the present moment. In essence, the Namaskar Mudra brings harmony within and shines it outward. The resonance of namaste and namaskar softly invites ego to make way for deference. Through this sacred salutation, we can acknowledge and pay respect to the divine souls around us, humbly remembering our place in the universe. Our lives are a product of polarities; masculine and feminine, dark and light, Yin & Yang. Amidst our eternal search for balance and yearning for union, this greeting serves as a reminder that everything we need is already within each and every one of us, right at our heart centre.